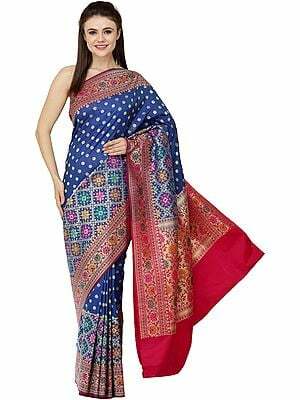 Banaras, or more commonly known as Varanasi in Uttar Pradesh, is the origin of the Banarasi sari. The manufacturing centres are mostly found in areas like Banaras, Gorakhpur and Azamgarh. 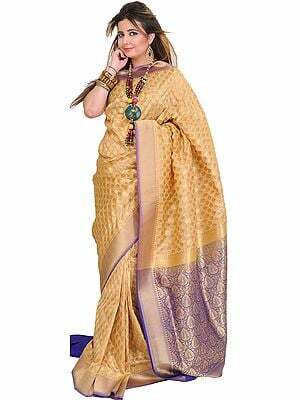 Though these classic saris are now woven in many parts of India. 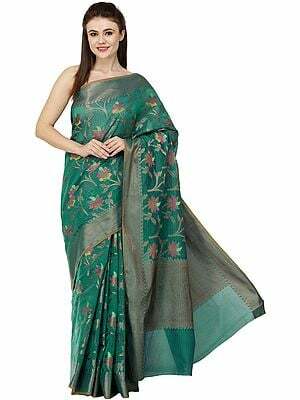 During ancient times, artisans and weavers of these beautifully crafted Banarasi saris are believed to have drawn inspiration from natural flowers such as Jasmine, Marigold, Thousand Emeralds, and even the leaves of Betel Nut for designs. 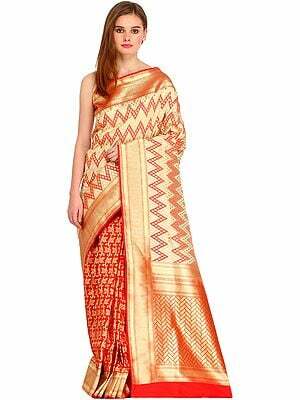 The diagonal stripes, floral patterns and corner motifs are some of the other patterns woven on a Banarasi sari. 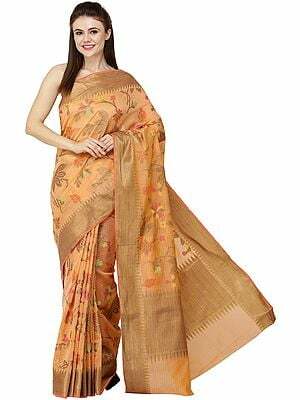 It is woven on a handloom by blending it with dobby or Jacquard mechanism. 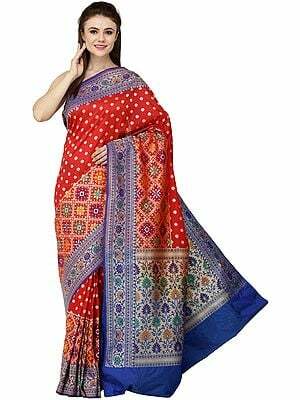 Normally, one sari requires about three persons to weave and may take from one to six months to complete it. The duration depends on the fineness and complexity of the designs. 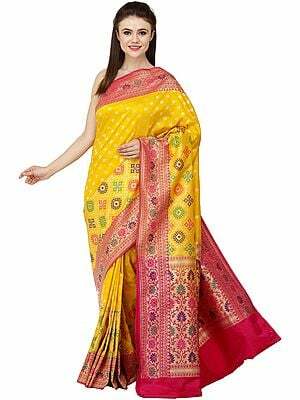 It would be interesting to know that an ideal Banarasi sari is made up of around 5600 thread wires, and all of them are of 45-inch width. The weaving of the warp requires the artisans to create the base first which is about 24-25 meters long. 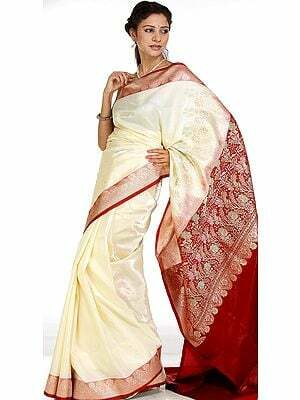 The most notable aspects of crafting a Banarasi sari is teamwork. Out of the three, one weaves the sari, the second rotates the ring to create the bundles and the third craftsman assists in the designing of the border. These saris are ranked as the finest traditional wear in Indian culture. Crafted delicately with ultimate perfection in the designs and floral patterns, these eye-catching saris come in striking shades and hues. 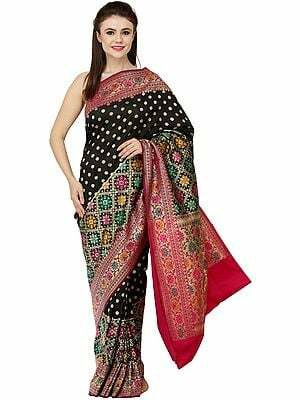 These days the traditional patterns are complimented with zardozi work, sequins, colourful beads, and different bootis to enhance the glamour and charm of Banarasis. Traditional Banarasi saris are specifically made in four types of fabrics that include pure silk, organza, Georgette, and Shatir. And, these are artistically filled with brocade designs of flowers like chameli, panna hazar, genda buti, and buits of betel leaves. 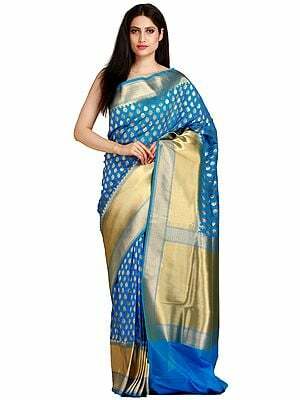 Originally, Bararasi saris were designed with threads dipped in real gold and silver liquids as these were basically used by the royal families. 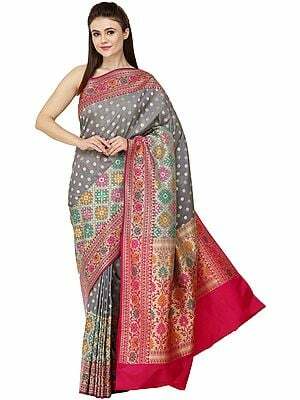 These days, the real gold and silver coated threads are replaced by golden and silver coloured threads that are made especially for Banarasi saris.